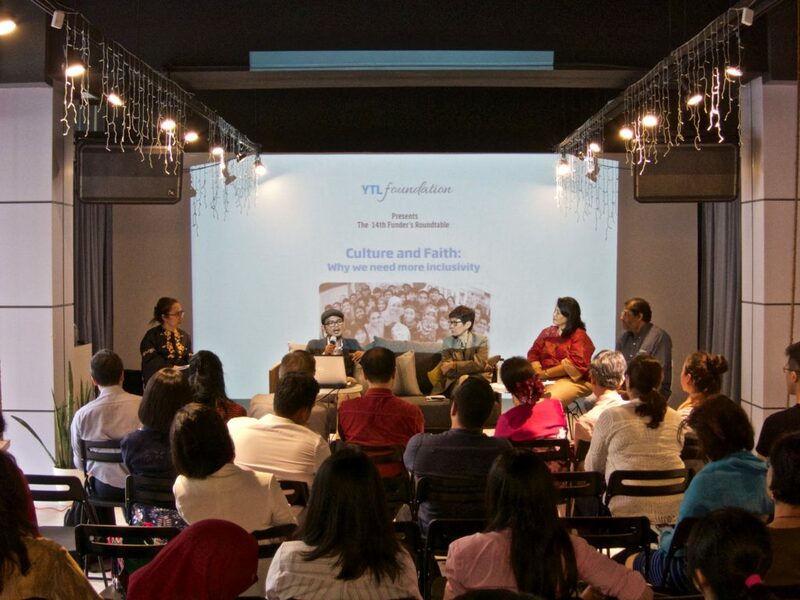 In response to APC member concerns on the rise of cultural and religious intolerance in the region, in collaboration with APC, YTL Foundation hosted the 14th Funders roundtable in Kuala Lumper on the topic of Culture and Faith: why we need more inclusivity. The roundtable explored how private funders can play a role in promoting tolerance and understanding between different religious and ethnic groups. Rita Sim, Co-Founder and Director CENSE, whose work includes understanding intercultural issues and the complexities of effective communication with ethnic communities. Zainah Anwar, Founding Member Musawah, a global movement (headquartered in Kuala Lumpur) for equality and justice in the Muslim family. Elisha Satvinder, Chairman Dignity for Children Foundation, which through education positively transforms the lives of underprivileged children and the lives of the community around them. Irfan Amalee, Co-founder Peace Generation Indonesia (and finalist at APC’s ASEAN Social Impact Awards in March this year), who promotes peace and tolerance to the younger generation through the use of creative media to bridge differences among communities. The panel was moderated by Dina Zaman, Director of Iman Research, a think tank focused on understanding countries and societies from the perspectives of society, religion and perception. The panel highlighted that diversity and conflict have concurrently built up over time with ethnic tensions at ground level due to disproportionate distribution and access to resources for different ethnic groups. They lamented that when they were growing up, their childhood friends were mixed, and there used to be more intermarriages, but now it is very rare. Communities needed to mix with other races more. With the youth, misconceptions of faith is a big issue. Misconceptions such as jihad being about violence is just the tip of the iceberg and need to be addressed from preschool age. The importance of education in aiding the understanding and celebration of diversity was reiterated across the panel. Quality education can not only equip children with practical answers to life, but also with the critical thinking skills to appreciate diversity and not be overly concerned about labels. With views around religion tending to stereotype and reinforce prejudices, parents’ prejudices are further perpetrated onto their children through the biased profiling of people on social media. We heard that many young people learn about Islam from YouTube, where the oversimplification of issues and black and white views of quick and narrow teachings promote misconceptions. One such example is the narrow classification of things into either halal or haram, whereas in actual records, there are different levels in between. Youths insecure with who they are may look for identity and recognition by joining militant groups such as ISIS. With violent extremism getting more attention, the increasing intolerance of youth and radicalisation of women are less reported but have a significant influence on their communities. There should be more focus on how women and children are approached and influenced by extremist groups as they are the most vulnerable groups. Peace Generation uses creative media, games and music to bring people of different religions together, an approach that works well for youth and millennials in particular. The approach of working on common ground and not religious differences is a valuable one. An understanding of religion based on equality and justice would help to counter and balance the radical interpretations. The roundtable highlighted the hard and largely unseen reality of what is happening on the ground in different communities, stressing the urgent need to promote inclusivity and to address the emergence of rising intolerance. A positive note is that insight from the panel and discussion point to a way forward through a better understanding and creation of opportunities for collaboration. Results of the 8 May election show the people want change and that change is possible. Post-election sentiments reflect a stronger sense of possibilities in Malaysia. While the vulnerabilities of people are an opening for negative influences, the same human traits through positive engagement can build the skills and resilience to counter extremist narratives and recruitment efforts. From the discussion, four focus areas were identified as opportunities for philanthropy to support the development of programmes with concrete solutions. For those interested to play a role in promoting tolerance and understanding, research and evaluation, leadership development, counter-narratives, and working through schools and education are a good place to start.